I began painting because I wanted to create art for my fanfics. I don't quite understand it but once I got into the swing of painting I hardly did anything related to my fics, but here is one of the few: my tale of a re-bodied Maeglin in the Third and Fourth Ages. Started painting in May 2015 because I wanted some art for my Tolkien fanfic on Fanfiction.net. Total newbie to digital art, and had no art lessons, so the first few months were very rocky. Made progress with lots and lots of pose references, endless inspiration from the amazing art here on dA and on tumblr, and COPIOUS use of eraser tools and the Undo button. Getting better at light and shadows & choosing colours. Getting a little better at anatomy too, but must have pose refs for almost everything. It has been pretty quiet on this account because my main Tolkien fanart is on dA as annamare. Do visit it to look at my best art! So far it's all Silmarillion-based and mostly within canon. This account was originally for my Tolkien fanfic-related art, but it's been so dead that I'm going to add assorted sketches and practice pieces here too, and use annamare for bigger pieces showing scenes from the Silm. Tablet: Wacom Intuos tablet (regret buying the medium, think small would have suited me fine). 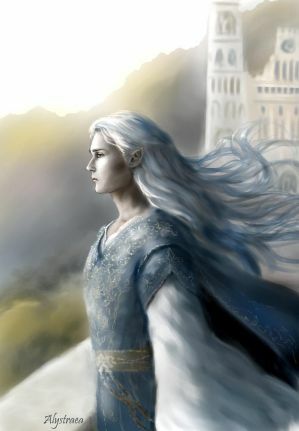 Círdan offering the elven ring Narya to Gandalf. Here is Galadriel with Nenya, and Elrond with Vilya. After drawing Galadriel with Nenya, I thought, "Why not do all the three elven rings?" 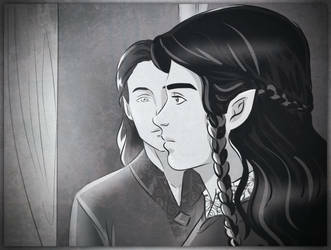 So here is Elrond with Vilya. No time to do new art, so touched up an old piece of the Lady of the Golden Woods. I've been planning to draw this for two years! After a really exhausting week of work I desperately needed to draw some fluff and this little sketch happened. Yay! Thanks for the watch!! I'll try to upload soon! Thanks for the lovely comments and faves!! Your art is so frickin incredible! Thanks so much! Your painting is awesome - so fluid and spontaneous - and traditional media are so much harder to work with! Thank you ^^ haha I find traditional media so much easier!! I've tried digital painting over and over again but everything I make turns out plastic looking and boring-- you're so good! The link to my story as promised it will be several chapters long so add me to your watch list! Thanks, dear! Enjoy writing your story.